Sherrod Campbell Brown (born November 9, 1952) is the senior United States Senator from Ohio and a member of the Democratic Party. Before his election to the Senate, he was a member of the United States House of Representatives, representing Ohio's 13th congressional district from 1993 to 2007. He previously served as the Ohio Secretary of State (1983–1991) and a member of the Ohio House of Representatives (1974–1982). Brown was born on November 9, 1952 in Mansfield, Ohio. He is of a Russian descent. Brown studied at Yale University and at Ohio State University. He was married to Larke Ummel until they divorced in 1987. He is currently married to Connie Schultz. 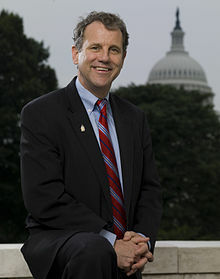 Wikimedia Commons has media related to Sherrod Brown. This page was last changed on 22 April 2019, at 17:31.